Recently I found an unaired pilot that the AWA filmed on the WWE Network. 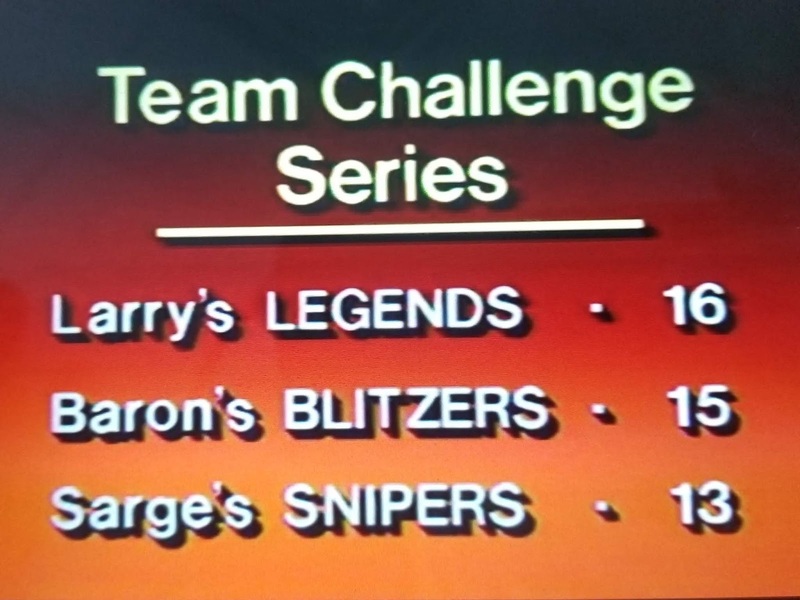 This was centered around the Team Challenge Series and featured wrestling in a studio with no audience. The wrestlers came to ringside with a very bad green screen showing fans cheering on while a audience noise track was played. They would cut to canned footage of people who appear to be in a bar. They might have been watching actual wrestling, but it was not these matches. 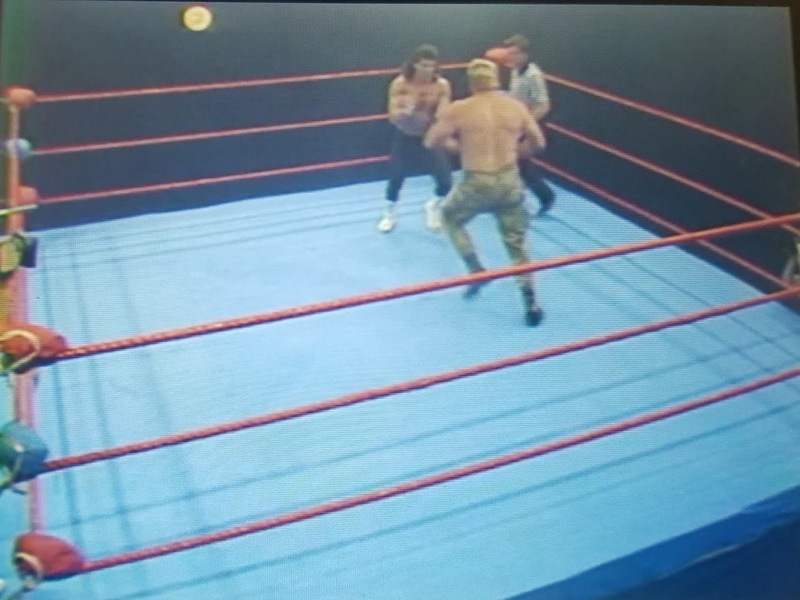 Even the camera angles with funky with the hard camera looking down at the ring at an angle and instead of center on the ring it was closer to a corner post. The opening features bikini clad girls in a ring that keeps say "Yay, yay, yay, for the AWA" with clips of the flag, AWA logo, some mat action, a rock n roll band, and the Beverly Hills knockouts. Vern Gagne greets us sitting on his dock looking like he's about to go fishing, while his dog sits on his lap. 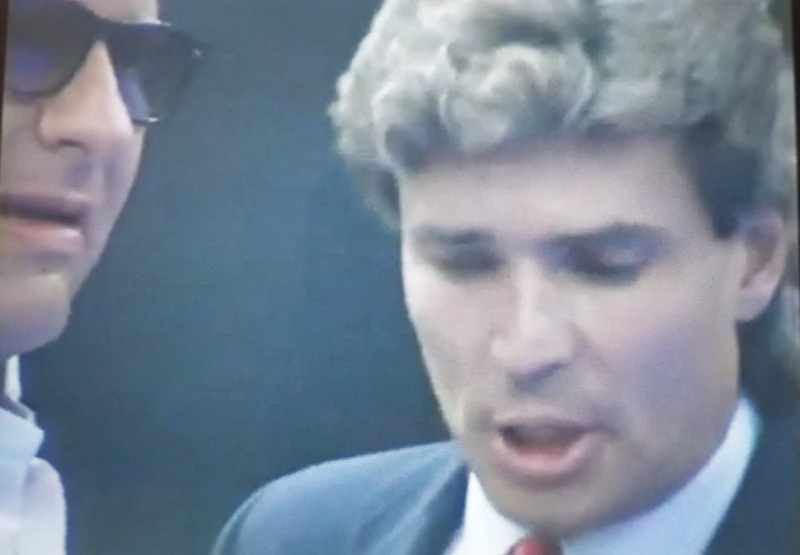 We then cut to Ralph and Greg Gagne in the satellite base letting us know that this product is nothing like we've ever seen before. We are going to feel the action, inside the ring. They are also providing the commentary, which is done in post production. Promo with Baron von Raschke of the Blitzers and Sgt. Slaughter of the Snipers talking about how Raschke's team member Paul Diamond taking on Slaughters team member Col. DeBeers. Promo from the Destruction Crew, Mike Enos & Wayne Bloom. I figured that this would be a squash match but for the first two minutes Mike Enos took a beating with no offense. He rakes Rice's eyes and tags in Bloom who takes over where Enos left off getting in no offense as Lynn and Rice work the left arm and shoulder. Finally the Crew took over on Lynn working the lower back until hitting him with the Doomsday Device for the three count at 4:39. The Crew took a beating for the first three minutes of the match. Post match Eric Bischoff conducts an in ring interview with Johnny V & The Destruction. Promo from Sgt. Slaughter talking about the team challenge main event with Col. DeBeers taking on Paul Diamond in an over the top rope king of the hill match. Cut to Col. DeBeers talking about his upcoming match. Ralph and Greg talk about how the teams are selected randomly which is why we have enemies on the same team. Beverly Hills knock outs segment is next. It's basically Foxy boxing, three 1 minute rounds and they have giant gloves. The ring looks like a 10 foot ring with the everlast turnbuckle pads covering all three ropes. 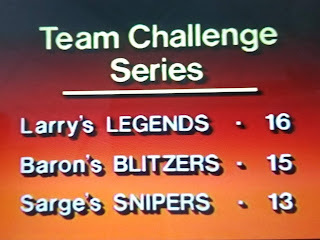 Ralph and Greg talk about the Team Challenge series, three randomly selected teams where each win gets you points. The winning team get $1,000,000! Promo from "Hard Rock" Paul Diamond about his match with Col. DeBeers. You can only win by throwing your opponent over the top rope to the cement floor. Paul Diamond with a an impressive looking dropkick until the slow motion replay shows that he never came close to hitting DeBeers with it. Otherwise it was actually a pretty good match. Finish came when DeBeers set up Diamond for a piledriver and he was back body dropped over the top rope at 5:49. 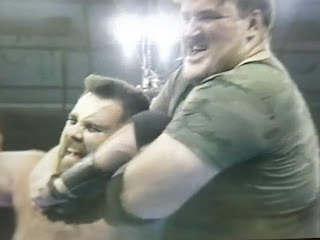 This match had a lot of lock ups into side headlocks with push off into the ropes to set up a spot usually a shoulder tackle. Once Slaughter did a high cross body for a two count. At the five minute mark Terminator finally got the upper hand by ramming Slaughter's head into the turnbuckle, but forty seconds later Slaughter was back in control. Finish came at 6:26 when Slaughter got the submission with the cobra clutch. Post Match: Eric Bischoff interviews Slaughter at ringside. Ralph and Greg Gagne sign off promising an exciting a hour of wrestling next week. All in all this was not a great hour of wrestling. 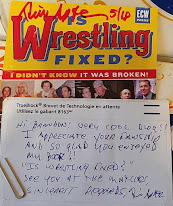 If this was the innovations that the AWA was hoping would bring fans to their product they were sadly mistaken.